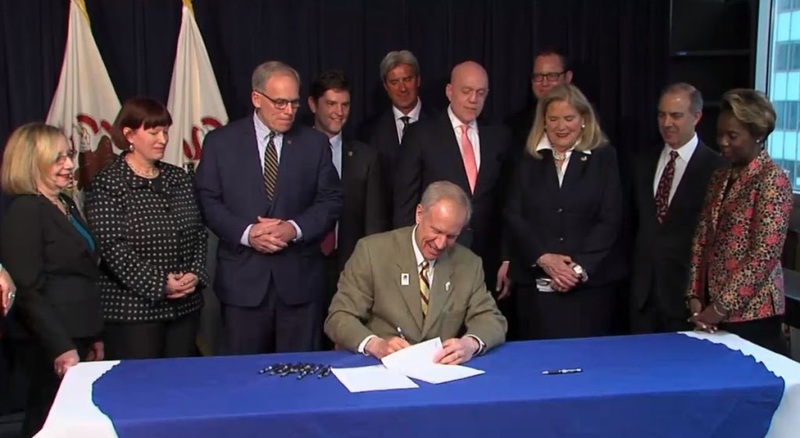 Governor Bruce Rauner signed bipartisan legislation today that protects safety net and rural hospitals while ensuring continued federal support for quality healthcare to more than three million Illinoisans. The Hospital Assessment Program is set to expire at the end of June. A bipartisan group of legislators worked with the Illinois Health and Hospital Association and the Department of Healthcare and Family Services (HFS) to redesign the program, create a more equitable reimbursement process, and ensure more efficient use of taxpayer dollars. “Hospitals are major engines of economic growth in our communities. The changes we were able to negotiate to the assessment program will provide for a more fair funding of Medicaid dollars to hospitals based on actual patients seen and severity of the treatment,” said state Sen. Dave Syverson (R-Rockford), one of the lead negotiators of the Medicaid hospital funding plan. “In a true achievement, Republicans and Democrats have come together to preserve Illinois’ share of vital Medicaid hospital funding and maintain critical health care services for our most vulnerable population, including seniors, the disabled, single mothers and children from low-income families. I commend my colleagues on the House and Senate legislative working group on a job well done along with members from the IHA, the MCO’s, Director Norwood of HFS, and leading health care professionals from across the state,” said state Rep. Patti Bellock (R-Hinsdale). “Today we are reforming and modernizing healthcare funding in Illinois and bringing $3.5 Billion into the state. Every hospital in Illinois benefits from this program, with priorities on safety-net and rural critical access hospitals, increased funding for behavioral health, trauma services, perinatal care and hospital transformations. I want to thank my Republican and Democratic colleagues and the Illinois Hospital Association for collaborating on this once in a decade effort,” said state Rep. Greg Harris (D-Chicago). “The changes to Illinois’ Hospital Assessment Program are important in two major ways: first, the limited yet critical Medicaid dollars available will go to the people who truly need it the most. Secondly, this not only helps patients, it supports taxpayers, as public dollars will be spent more efficiently and effectively. This is a major step in the right direction that will enhance our Medicaid program for everyone involved,” said state Sen. Dale Righter (R-Mattoon). “The hospital assessment program is the lifeblood of healthcare in Illinois. The modernized assessment allows healthcare dollars to be spent where they should be -with the patient. I’m proud to have served on the bipartisan working group to deliver meaningful reform that will transform Illinois healthcare for years to come,” said state Rep. Ryan Spain (R-Peoria). “This bill supports Medicaid patients by improving rates paid to providers and ensuring that money follows the patient. The bill also creates a Hospital Transformation Committee that will help reconfigure our healthcare system to ensure that we’re meeting the needs of our communities,” said state Rep. Tom Demmer (R-Dixon). “On behalf of hospitals and health systems across the state, the Illinois Health and Hospital Association commends the Governor, the General Assembly including the Legislative Medicaid Work Group, and the Department of Healthcare and Family Services for taking action to continue and modernize the Hospital Assessment Program. This essential and vital program, which brings the State $3.5 billion annually, helps ensure that Medicaid beneficiaries and all patients in Illinois have access to the quality healthcare they need when they need it” said IHA president and CEO A.J. Wilhelmi. “This updated and redesigned hospital assessment program is of critical importance to our hospitals, and more importantly to our patients, families and communities we are privileged to serve. This change helps ensure that we are able to continue providing high quality healthcare to all Illinoisans” said the IHA’s Bill Santulli. The governor also signed SB 1573, related to Medicaid managed care operations and reporting.